With A Grateful Heart: Just Being 'Neighborly'! My dear mother and I are off to Oregon City, 9 miles from our town, to shop at the 11th Annual McLoughlin Neighborhood Sale. There are over 300 families participating at 80+ sites throughout the historic district of Oregon City. (Only 57 sales are open today!) We have enjoyed this event the last two years and we have our sale maps and walking shoes on – we are ready to go! 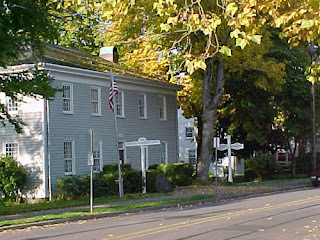 Oregon City was the first incorporated city west of the Mississippi. 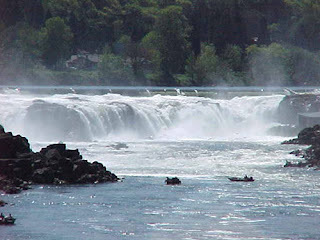 It was established in 1829 by Dr. John McLoughlin as a lumber mill near Willamette Falls and later designated as the first capital of the Oregon Territory and the cradle of American government in the Northwest. Dr. McLoughlin is known as the Father of Oregon. He was a Canadian born chief factor of the Hudson's Bay Company and a firm supporter of settlers who wished Oregon to be independent from England. He is credited with starting Oregon City. 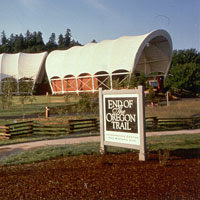 Oregon City is also the home to the traditional End of the Oregon Trail. Many of the wagon trains disbanded on Abernethy Green in Oregon City. Today the End of the Oregon Trail Interpretive Center - a museum devoted to the history of the Oregon Trail - stands on this site. This area is rich with history and natural beauty. We are so fortunate to live here! What fun! I would love to be able to go with you both! Hope you find lots on wonderful things. Your blog is so restful and filled with positivity and beautiful imgages. Makes me think of the Whatsoever is, good, pure, beautiful, verse in the Bible. I enjoyed a long time of browsing through your past postings, too. Thank you.